I showed this revamped T-shirt on my model a short while ago. See here – hand painted T-shirt. The sleeves and neck were trimmed to make it into a tank top. I mentioned that I had not yet laundered the shirt and wondered how well the fabric paint would withstand washing. The shirt was hand washed and to my surprise, the colour remained fast. So there you go. 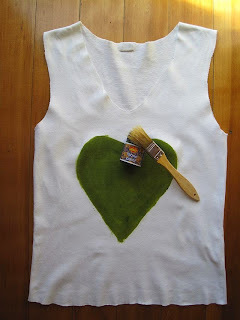 Fabric paint is easy to come by. You can see a tub in the photo. I used a pastry brush to paint it on the top. Mix the paint with water in a glass bowl to get to the consistency you require. I slipped an old plastic shopping bag between the back and front of the T-shirt to stop the paint seeping through to the back of the T-shirt. Then you paint whatever you like. The heart shape was an easy beginner design. Only thing I did notice was that if I painted over an area that had been painted, the colour went darker. It’s sort of 1 + 1 = 2 in tone. A few more T-shirts will be subjected to similar treatment given how easy this process is. Find the Greenie Galleries at the top of the page for an archive of older and newer posts. There are posts on jewlery making and crafting, home decor and DIY beauty items and lots more.